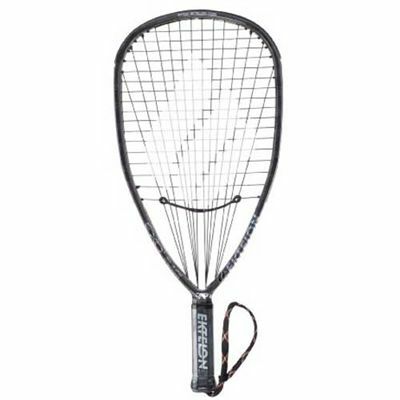 The Ektelon EXO3 Black Racketball Racket features a new suspended string bed and EXO3 technology which produces the highest power level racket ever without compromising manoeuvrability. It's like having a supersized 117 square inch headsize racket at 106 square inches. Extraordinary feel is achieved by minimising shock and providing ultimate frame stability! Includes 2 Power Plugs for use at 5 and 7 o'clock for additional frame weighting and extra stability. 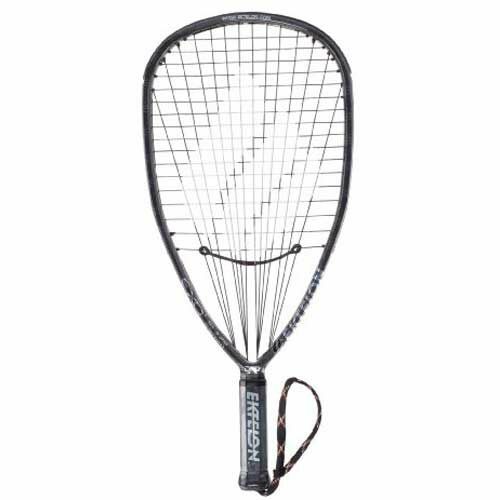 The Ektelon EXO3 Black Racketball Racket includes the patented Energy Bridge and Energy Channel design. The Energy Bridge is an exo skeletal structure that suspends the string bed from the frame, producing a virtual head size that is 10% larger, while expanding the sweet spot up to 51% for ultimate power. In addition, frame vibration is reduced by up to 63%. Enhancing the dynamic effects of the Energy Bridge is the patented Energy Channel. This sculpted groove within the frame significantly improves stability by moving mass to the outer edges of the frame, for incredible control even on off centre hits. for submitting product review about Ektelon EXO3 Black Racketball Racket.